Looking for a challenging pitching workout that combines control, pressure and fun. I’ve got one for you. A perfect pitching workout for this part of the season. This time of year workouts can get boring and routine. It can be difficult to create new workouts that challenge your pitchers in a refreshing way. Recently I modified a fun challenge we’ve been using and our pitcher’s loved it! This workout creates challenge, variety, and difficulty in a game-like environment. Here’s how it goes. I use old pop tart boxes that I’ve torn the tops off of, have one box for each of our 4 pitchers, and put 4-5 of each of the 3 options above inside the box. Once your pitchers are warm, they place their box beside them (or carry them with them if your pitchers have to share rubbers in the bullpen). Each pitcher operates separately from the others, and each pitcher goes at her own pace. 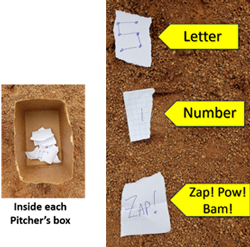 If the pitcher pulls a Letter – she pitches the letter. In the case of the S, the pitcher would start at zone 2 – throw whatever pitch they throw to that zone, continue to zone 1, then 3, then 4, then 5 and end with 6. If they miss a zone, they don’t repeat it, they move on. They’re only able to re-do 1 spot, but not before they complete the letter. If they pull a Number – they throw a pitch to that zone. In the example this pitcher drew a 1, so she’d throw whatever pitch she throws to zone 1, again, no re-dos. If they pull a Batman Word (Zap! Pow! Now! Bam!) she grabs a batting T, place it on homeplate with a ball on it, and get one pitch to knock the ball off the T.
Randomly, call out – 1 Pitch! – and then call out a location. All your pitchers stop what they’re doing and pitch 1 pitch to that location. If they hit it, they resume what they were pitching previously. But if they miss, the pitcher and the catcher run foul poles down and back, and then resume their pitching. This workout has enough of a mix of pressure, pitch sequences, and location that it’s a great way to prepare your pitchers for a game, while creating enough variety to engage them and their best effort.